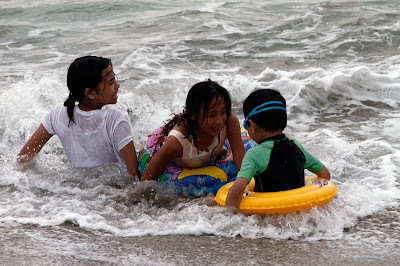 This post brings me back to our vacation in the Philippines last January 2011. One of my must-do in my list was to go to the beach. It did not matter where, for as long as I can feel the warm waters, I'll be one happy man. Thanks to my good friend Leo who made arrangements for our transportation, we soon found ourselves enroute to La Union. Sonny, another high school buddy, happily joined us. To make the trip less of a hassle, we decided to just buy whatever we can from the local market, and of course we must have some lechon manok (roast chicken) too! 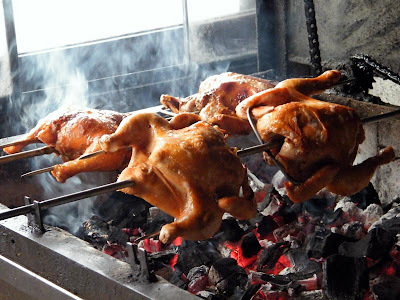 A number of roadside stalls sell this, so we'll just stop by one shop and buy a chicken. And while we're at it, we might as well buy inihaw na bangus (roast milkfish) also. We were in for a surprise. 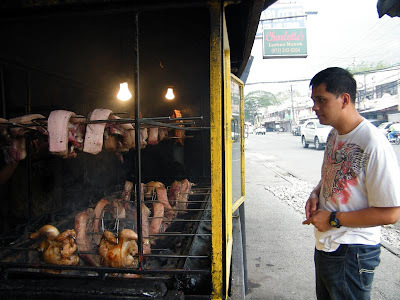 The stalls do not sell inihaw na bangus! We assumed that since the area has fishponds, then they'd readily sell these cooked. What we didn't realize is they'll assume that beach-goers want their milkfish fresh for grilling by the beach! But we weren't prepared for grilling so we passed off having fish for lunch. 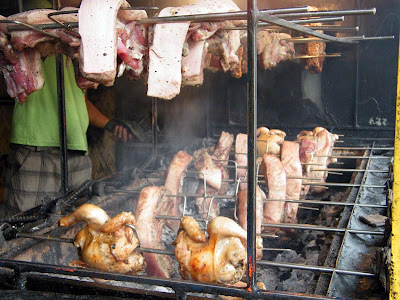 Good thing then that they were also roasting a fresh batch of liempo (pork belly strip). 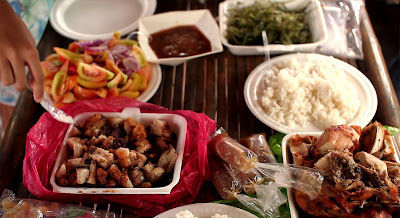 Armed with our chopped lechon manok, liempo, sauce, fruits and rice cakes and salted egg salad (recipe in my next post! ), we were off for a fun day at the beach!